When you’re unwinding with shows and movies after a long day of classes, don’t settle for a tiny laptop or smartphone screen. You deserve better. There are plenty of excellent TVs out there that are affordable, even on a student budget. This model works great for small bank accounts and cramped dorm rooms. You can set this little guy up on your desk or turn a side table into a TV stand. Since it’s only 24″, it’s not quite big enough to share with the whole residence hall. And while the 720p resolution is smaller than the preferred 1080p, it works just fine for a small TV like this one. With only one HDMI port available, you’ll have to switch cables every time you change between devices, like from a PlayStation 4 to a Roku Streaming Stick. But don’t worry—you can snag an HDMI splitter on the cheap to avoid that problem. Oh! And this TV comes in white casing as well as black, so you can choose the model that best fits your style. If you’re looking for something a bit bigger than the LG model above, this Samsung model has a 32″ screen. You can enjoy a TV this size up to 8′ away, which means you’ll have a lot more flexibility with where you put this in your dorm room. This TV also has two HDMI ports, audio ports for speakers or a soundbar, and other ports that work well for old TV devices—like your family’s ancient DVD player your dad foisted on you. We’ve noted before that Samsung is a reliable TV brand, so if you want a TV that can get you through college and beyond, this is a good choice. On the fence? If you’re not sure this is the perfect TV for your dorm room, look for another TV between 19″ and 32″. Anything much larger than that and you’ll have to build a shrine around your television because it’s going to dominate your space. In a college world where one bowl is used for three meals, you’ll surely appreciate the versatility of using a computer monitor as a TV screen. HP is an experienced monitor producer, and this monitor gets especially high reviews. Hook it up to your laptop so you can research with two screens for college midterms or stream online videos on the “big screen” when you need to relax. If you have TV service, just connect this monitor to your cable box with an HDMI cord. It’s also good for gaming on both computers and consoles. The height-adjustable stand makes it as easy to watch from your bed as it is from your desk, but the integrated speakers aren’t very powerful. If you’re usually the one who asks to turn up the volume, you may want to consider getting an external sound system. If you want a powerful TV for the whole apartment to enjoy, this TCL model has a lot to love. It not only has best-on-the-market 4K Ultra HD picture clarity and a high refresh rate, but it also comes with a built-in Roku player. Smart TVs change the game of watching TV. 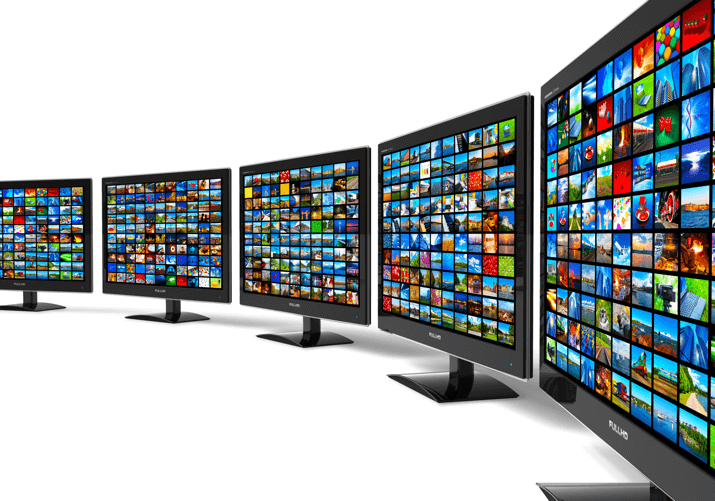 This one offers over 4,000 streaming channels, which you can use to access all your streaming subscriptions to create the ultimate viewing machine. And since the Roku phone app functions as a remote, it doesn’t matter if one of your roommates loses the remote that comes with the TV. The 55″ screen fits well in most apartment living rooms, which gives you peace of mind if you’re thinking about moving from a dorm to off-campus housing next year. Writer’s Note: I was so impressed by this TV that I bought it for myself. It was amazing to graduate from my TV/monitor combo to a smart TV, and I’ll never look back. This TV is where it’s at. Now please excuse me as I return to my eternal bingeing spree. (Brooklyn Nine-Nine forever.) Ciao! Plenty of people in college host parties, but a projector will make your parties legendary. Turn off the lights and convert your entire wall into a screen, or grab an extension cord for a movie under the stars. This projector has plenty of connectivity options, so you can hook it up to a cable box, laptop, console, or smartphone. 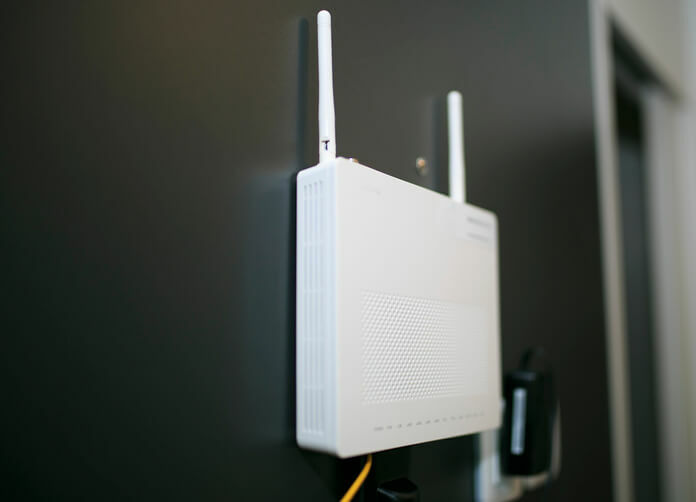 However, there is no Bluetooth capability, so get the right cables for what you want to connect to. It also has a built-in speaker, but you’ll probably need a stronger supplemental sound system for big open spaces. 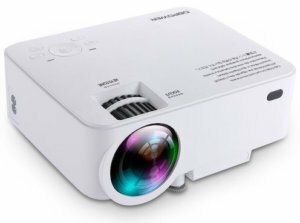 Despite its limitations, this mini projector is affordable, mobile, and offers a big-screen experience, which is perfect for a student who’s on the go and ready to party. 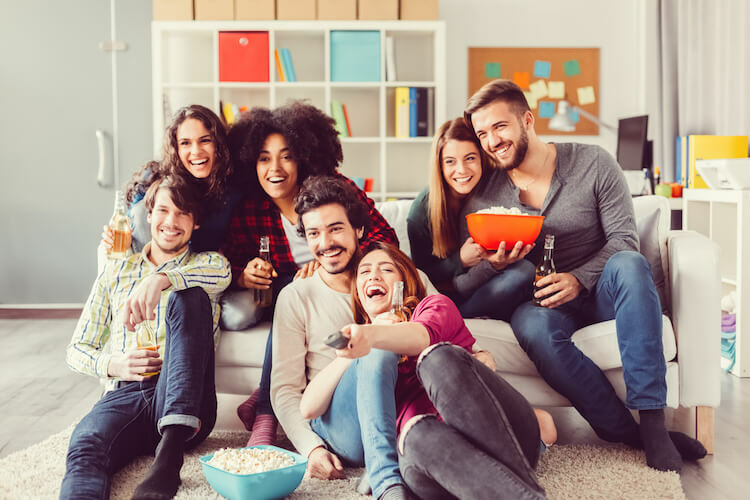 When you’re purchasing a TV for your college dorm or off-campus housing, it’s helpful to know a few things that set TVs apart from each other. Which TV brand should I get for my dorm or apartment? While name-brand TVs like LG, Sony, and Samsung have a history of excellence, some cheaper rivals like TCL are proving to be reliable too. Don’t pay more just because a name is more familiar. Name-Brand TVs vs. Their Cheaper Rivals: What’s the Difference? 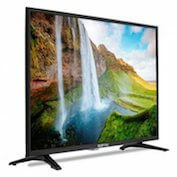 What TV size should I get for my dorm or apartment? The best size for your dorm room will be around 19″ and 32″. If you’re looking for a TV for the living room, the best size will depend on the size of the space, but a TV between 32″ and 63″ should work for most student housing. 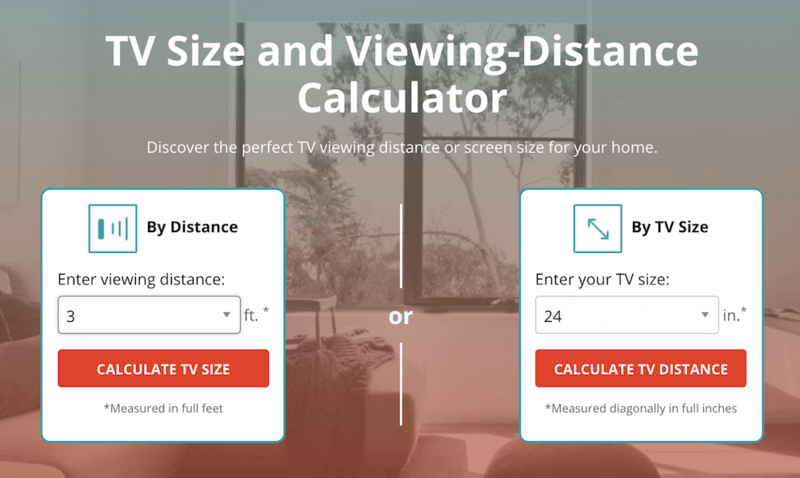 To calculate the perfect TV size for your dorm room or apartment, check out our TV Viewing Distance Calculator. Refresh rates are how often the picture on your screen changes, which is what makes a movie look like it’s moving. The current standard is 60Hz, meaning the picture changes sixty times per second. Save on a TV with Amazon Prime. Buying a TV can be pricey, so take savings wherever you can get them. Start with this: Amazon offers 50% off Amazon Prime memberships for students. 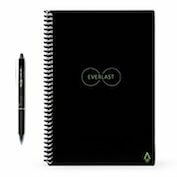 Not only can that help you get a better deal on a TV, but it can also help you save on textbooks, school supplies, groceries, and more. Amazon Prime also offers a lot of streaming content. So if you set up your TV as a smart TV, you can enjoy shows and movies for free with your membership. The TVs above are great for all kinds of college lifestyles. 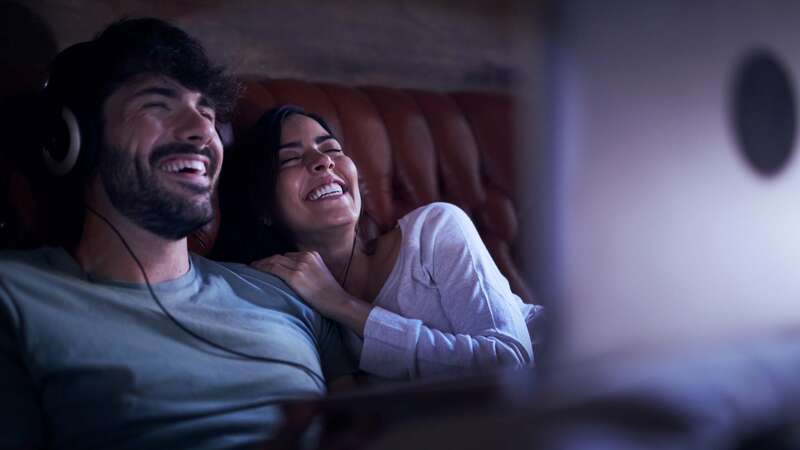 Once you’ve decided on the one for you, we can help you find cheap and free TV services and figure out how to get student discounts on cable. If you’re going the cable TV route, check which TV providers service your college town by entering your zip code below. Signing up early can help you beat the rush of move-in day.